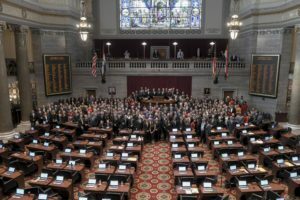 The Missouri House has passed a bill that would require inspections for vehicles at least 10 years old or with more than 150,000 miles, instead of the usual every other year inspections. Current law requires the inspections for vehicles more than five years old to renew a vehicle license. During floor debate today, bill sponsor J. Eggleston, R-Maysville, tells Representative Jason Chipman, R-Steelville, that he’s visited some of Missouri’s eight neighboring states and none of them require vehicle inspections. “It must have been like dodging all of those terrible vehicles that don’t get inspections that are just falling apart constantly. How did you make it back to this body,” asks Chipman. “It really didn’t look a whole lot different than our state,” replies Eggleston. Representative Chris Dinkins, R-Annapolis, says the requirement is a hardship for some rural Missourians who have to drive 45 minutes for an inspection. Vehicle maintenance workers are to check a vehicle’s braking, steering and exhaust systems. Lights, turn signals, wipers, seat belts, tires and the horn are also checked. Under the bill, nearly 1.2 million Missouri vehicles would no longer be required to get the safety checks. The inspections cost about $12. Representative Judy Morgan, D-Kansas City, says the measure would be a blow to the state’s fund for road and bridge maintenance. “At this point in time, any loss we have to the highway revenue is a huge loss, considering the MoDOT funding crisis. In addition, the highway fund could lose up to seven positions,” says Morgan. The measure, HB 451, passed 102-45. It heads to the Senate for consideration.